It hurt then. It still hurts now. It will probably still hurt next week, and even next year. I don't expect Michigan fans to get over it, especially not quickly. But we can't hide from it, we can't pretend it didn't happen, as much as we want too. I'm am going to breakdown what I saw on that dreadful infamous final play, and some thoughts from others around the sports world. It's what all of you saw too. It was 4th and 2. There were only a mere 10 seconds to go. Michigan lined up to punt, the clock was stopped, and the Spartans had nobody back to receive the punt. It was all or nothing for them, block it. For Michigan, get the punt off and the game was over. When Michigan State didn't send a returner back to receive the kick, I was sort of in shock. Blocking punts happen, but so do punt return touchdowns. I thought to myself, call a timeout (Michigan). Subs could have been made to counter the blitz of the Spartans. Jim Harbaugh obviously knows more about football than I, and he went with the play. When the Wolverines and Spartans broke the huddle and lined up, the Wolverines looked up and saw no returner, and 11 guys ready to go full blast at punter Blake O'Neill. Michigan long snapper Scott Sypniewski likely went into panic mode, hence the low snap. O'Neill with his Aussie style punting thought we could still make a play running a few steps before kicking it away, unfortunately the Spartans ran him down before we could get a foot on the ball, and it went right into the hands of a Spartan player, who took it 38-yards for the score. Should O'Neill have fallen on the ball? Sure. But that's 20/20 hindsight. If O'Neill believes he could have made a play, I trust him, and believe that yes he could have made a play. He punted a ball 80-yards earlier, I trusted him to pick it up and just get his foot on it, unfortunately like I said the Spartans stampeded towards him. If he were to drop another snap this season, I still trust him to make a play if he feels he could. There are two things that could have turned that play around. Both of which were brought to my attention late Sunday night. One was pointed out by Marcus Ray. It is close, but Ray does make a good point, that COULD have been called. With at that point, the Wolverines have a 99.8% win percentage (God that hurts), there isn't an excuse to NOT make that call, unless you don't see it. There may have been a penalty, but it needs to go behind us.This will hurt because Michigan fans will hear about it for the next year from Spartan fans, and because it will be almost two weeks before this team hits the field again. But, better does are coming. 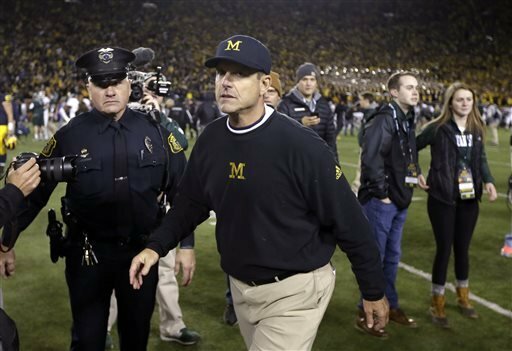 Just remember, Jim Harbaugh is just getting started here.